Businesses in India are constantly looking to grow. With growth in mind, the business owners and managers are continuously evaluating how to maximum value, how to enhance the promoter foothold, how to unlock value, how to enhance ability for future fund raise etc. Even regulatory changes such as introduction of the new Companies Act, adoption of new accounting standards in India (Ind-AS), changes in the SEBI Takeover code and other regulations, Competition law and introduction of ‘GAAR’ require business houses to evaluate alternate corporate restructuring tools to achieve compliance with these changing regulations along with desired business goals. 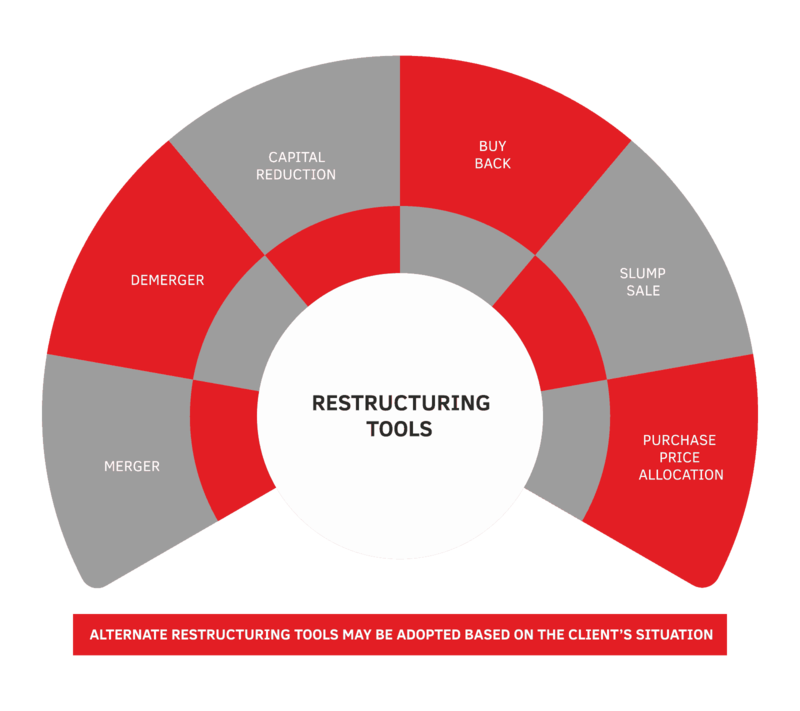 Restructuring tools such as mergers, demergers, hive offs, capital reduction, buy back etc. are often adopted by corporates in India for better efficiencies in business. With our demonstrated experience in this space, we can pre-empt the client’s business need and suitably advise on the restructuring approach that may be adopted. We assist in identifying alternate corporate restructuring options that may be available, critically evaluate the same from each stakeholders perspective (shareholders, promoters, employees, vendors, business partners etc. ), identify potential tax costs associated with it, suggest suitable options for cash and tax rationalisation, evaluate regulatory hurdles if any, and help appropriate decision making. With our deep domain knowledge, we understand the changing tax and regulatory environment, and thus, provide solutions that are sustainable for a longer time for our clients. Given our end to end approach, we assist our clients in complete implementation of the restructuring plan by drafting / reviewing suitable documentation (schemes, buy back offers, board resolutions, shareholders approvals etc. ), seeking appropriate stock exchange approvals (for listed companies), making applications and necessary representations before the NCLT (National Company Law Tribunal), obtaining necessary regulatory approvals (such as from Regional Directors, Registrar of Companies, Official Liquidators, Reserve Bank of India etc. ), stamp duty adjudication etc. Our teams even assist in the post restructuring support. For details read section on Post Deal Support.